If you have found white worms in dog feces (faeces) from your dog, these are almost certain to be roundworms. I recently had a question from a reader, asking whether heartworms could be passed out in the feces and found in their dog’s poop. The answer is, definitely NO! Intestinal worms are the only kind that you would find. Heartworms live in the blood vessels, the tiny worm larvae are killed by the monthly preventatives and, if your dog is unlucky enough to need treatment for adult worms, the Immiticide drug kills them and they break up into small pieces and destroyed by a process known as phagocytosis. You can read more about this process in this article (scroll down to the section headed “Immiticide” to find the information. They can be up to around 20 cm in length and look spaghetti-like and coiled up (sorry, if you are a pasta lover!). White worms found in dog poop should be taken very seriously as Toxocara Canis (the type of roundworm that affects dogs) as well as the types that affect cats can be passed to people. Children are the most likely to be affected because the worm eggs which are passed out in the feces, contaminate the soil and get picked up on children’s hands in the normal rough and tumble of play and it is easy for them to be transmitted to the mouth and swallowed. Looking for more information about Dog Worms? Roundworms in dogs: Read the full article about roundworms here. 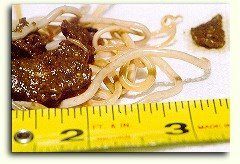 Whipworms: This article looks at another very common internal parasite in dogs, what symptoms to look out for and how your vet will detect this type of worm. Hookworms: These are also internal parasites in dogs that can be transmitted to humans. Trifexis: Trifexis is a heartworm preventative that also treats other intestinal worms and kills adult fleas. Once inside the body the worms hatch out and move around. Not only can they cause blindness when they migrate to the eyes, but there is also research that has implicated Toxicariasis (infection with roundworms) in epilepsy, particularly in children under five years of age. You can read more information in this article on Toxicariasis on Wikipedia. This is a great reason for picking up dog feces from your yard and cleaning up after your dog when you walk him. It is also a good idea to buy a cover for the children’s sandpit so that when it is not in use, it can be protected from cats who would love to defecate there. Sand is a particularly good medium for the roundworm eggs. As puppies can be infected whilst still in their mother’s womb with roundworms passed from their mother, you need to start worming your puppy from around two weeks of age. A serious infection of roundworm could lead to a ruptured bowel so be a responsible pet owner and ask your vet for advice on the correct worming schedule. Monthly prescription heartworm prevention for dogs medications will control roundworms too but until your puppy starts on the preventative treatment schedule, you need to get him wormed. 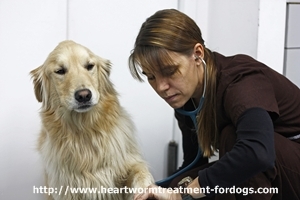 In the UK where dogs do not get heartworm infection, you should be worming your dog about every six months. Alternatively, as roundworms continuously lay eggs and an infected dog will always have some in the faeces, you could take a sample to your vet for testing. This enables you to only treat your dog if it needs to be treated and avoids giving him unnecessary medication. However, you should bear in mind that having the faeces examined for worm eggs will probably cost more than a wormer! This video gives some helpful information about worming your dog, skipping the first fifteen seconds will avoid the adverts! If you suspect your dog of having worms either because you have seen white worms in dog feces or because he is exhibiting any of the classic symptoms, (bloating, diarrhoea, sickness, loss of weight and condition or lethargy) and he is on a heartworm prevention plan, take a sample of your dog’s feces in a sealed container to your vet for examination. You should not try to treat the problem yourself as you must not mix wormers.